Kampala Kasubi Tombs of Buganda. In 1882 Kabaka Mutesa relocated his Kibuga (palace) to Nabulagala Hill, briefly the capital of his father Suuna II some 30 years earlier, and renamed it Kasubi Hill after his birthplace some 50km further east. Mutesa constructed a large hilltop palace called Muziba Azala Mpanga (roughly translating as “a king is born of aking), where he died in 1884 following a prolonged illness. As was the custom, Kasubi Hill was abandoned after the king’s death-his successor Mwanga established a new capital at mengo Hill-but rather less conventionally Mutesa was the first Kabaka to be buried with his jawbone intact, in a casket built by the Anglican missionary Alexander Mackay. 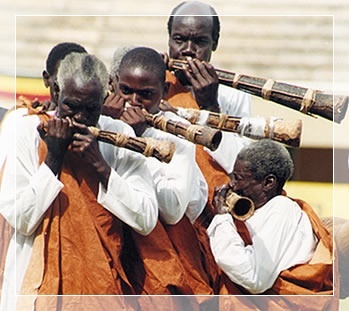 In further break with tradition, Kasubi rather than Mengo was chosen as the burial place of Kabaka Mwanga in 1910, seven years after his death in exile. It also houses the tombs of his successor Daudi Chwa II, who ruled from 1897 to 1939, and of Edward Mutesa II, whose body was returned to Uganda in 1971, two years after his death in exile. The tombs are housed within the original palace built by Mutesa, a fantastic domed structure of poles, reeds and thatch, which-aside from the additional concrete base and sliding glass doors in 1938-has changed little in appearance over the intervening 130 years. 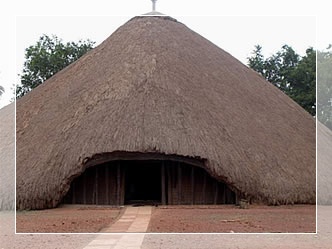 The former palace contains a fascinating collection of royal artifacts, ranging from traditional musical instruments, weapons, shields and fetishes to exotic gifts donated by Queen Victoria- as well as a stuffed leopard once kept as a pet by Mutesa I. the giant rings in the roof of the hut each represent one of the 52 clans of Buganda. The four royal tombs, obscured behind a red bark cloth veil, are off-limits to the public, and visitors must remove their shoes before entering the palace. The tombs are maintained by the wives of the various Kings-or more accurately by female descendants of their long-deceased wives- some of whom live on the property, while others do a one-month shift there twice every year. Many of the Kings’ wives, sisters and other female relations are also buried at Kasubi, not in the main palace but in the series of smaller buildings that flank the driveway. The complex is entered via a large traditional reception but known as a bujjabukula. This is tended by the chief gateman, known as Mulamba (a hereditary title), who customarily dresses in a brilliant yellow bark cloth robe, as do his assistants. An excellent booklet on the tombs is sometimes on sale at the site, and well worth buying for its background information on Buganda cultures. To get there from the city centre, follow Namirembe/ Nateete Road east for about 1km until you reach the pinkish Kampala Regency Hotel, immediately before which you need to turn right into Hoima Road. After nearly 2km you will cross over Nakulabye roundabout and 2km further on you will reach Kasubi market at the junction with Kimera road, from where the tombs-signposted to the left-lie about 500m uphill along Masiro Road. Other Attractions and extensive information about Uganda and one of its most sought after attractions such as the bwindi gorilla park may found on our extensive website.